First, the company where my Dad worked closed their doors during my senior year in high school, so I didn’t want to be a further burden on my family with college tuition. And, unfortunately, coming from a small town and thus small school system, our guidance counselors weren’t the best at providing guidance. Second, I scored very high on the ASVAB test and all the services were recruiting me (lots of calls and visits). I recall the Navy recruiters coming after me to be in their nuclear programs, but the Marine Corps was talking to me about aviation electronics and that interested me the most. 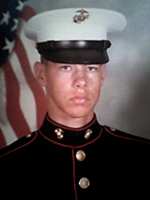 Third, my brother went into the Corps a year before me. I figured if he could do it, so could I. After boot camp I had a new respect for my brother. As he was going through, and I had decided to join, we never talked about the challenges of boot camp. What an eye-opening experience, starting with getting off the bus and onto the yellow footprints. Oh, and the Dress Blues uniform is the best! 3) Don’t go to Okinawa. accomplish that goal. Work hard and go above and beyond and you will be rewarded. I came close to not accomplishing #2. At one point my roommate had taken a bunch of us out into town to meet with a bunch of college girls who were visiting with his girlfriend and her family. They were in town for about a week, so we spent quite a bit of time with them. They were interested in seeing what our rooms were like so we decided it would be a good idea to sneak them in the back way. Since we lived on the second floor of the barracks, there was quite a long ladder (stairs for the civilian crowd). We thought we had it all covered since the Duty Sgt. sat near the entry at the front of the building. What we hadn’t counted on was an MP on patrol in the area. He apparently saw our actions and brought the Duty Sgt. up to our wing and went door-to-door until they found the room with the girls…our room. Fortunately, our Sgt. Maj. seemed to have a soft spot for us. Instead of formal charges and a trip to see the “Old Man”, he decided an appropriate punishment would be for us to clean up the squadron area. Man, I’m thinking NJP (office hours) would have been an easier thing to go through. Needless to say, we learned our lesson…and the squadron are was spotless. Oh, and several of us continued to date the girls for years to come. those who went before us and were tested in battle. The closest I got to action was when we went on a heightened state of alert when a Russian submarine and Russian aircraft were spotted off the coast of North Carolina. We, and the Air Force, scrambled some planes to go take a look. We stood down shortly thereafter, but it was exciting while it lasted. The next most exciting thing happened during a NATO exercise in Denmark. On our last night in country we had moved most of the squadron to a staging base for their flight home. 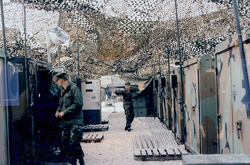 Since I was with the advance party and the return party, I and several others were left at our field location to guard the equipment prior to its removal. A few of the locals had caught wind of the fact we were leaving the next day and thought they would travel out from town to our base. I was on duty while the others slept, awaiting their turn. A car passed the gate but stopped just beyond. Two guys got out and staggered over to the gate and wanted to come in and party with us. I explained the situation to them and kindly asked them to return to their car and go back to town. The driver insisted they be allowed to come in and continued to move forward. During this time we were not allowed to have loaded weapons on guard duty, so I was playing through my mind my options, and how, if possible and necessary I was going to get a shell in the shotgun for use. My first thought was to cycle the pump and scare them, which is precisely what I did, but it only had an impact on the passenger. He ran to the car rather quickly. I also think I smelled an odor as he did so. Unfortunately, the driver was not fazed by this action. So, I asked him to follow the actions of his passenger and kindly return to the car before this escalated and something happened that we both didn’t want. He once again advanced, and it was at this instant I raised my weapon to let him know I was not going to allow him in or take one more step towards me. Upon seeing the working end of the shotgun he decided his passenger was not so dumb after all. He returned to the vehicle and they turned around and headed for town. At least that’s what I thought until I saw brake lights about a half mile down the road. Next I heard a sound of something rustling off to my right (from the direction they would have come back). I shouted out, “Halt, who goes there?” Nothing in response. I woke up the next guard and instructed him to watch the gate while I investigated. As I got nearer, I could see someone stumbling in my direction. Again, “Halt, who goes there?” Again, no answer. I advanced once more and instructed the person to immediately halt, place their ID on the ground and back up 10 steps and get face down in the dirt. This time they complied. Once I arrived at the ID I picked it up and shined a light on it. It turned out it was one of our officers returning to base after being out in town. False alarm. He and I never spoke of the event again. It’s a toss-up between 29 Palms, CA and Cherry Point, NC, for my fondest. 29 Palms is special because I was stationed there with my brother for a year. He was with 3rd Tank Bn, and I was going through MCCES. We spent a lot of time together when he was not out in the field for training maneuvers. I’ll never forget the weekend he and another Marine from 3rd Tanks were working on a tank and were just wrapping up putting “the pack” (engine and transmission) in, and were going to take it for a test run. They invited me to come along for the ride. What an experience it was. They even gave me an opportunity to drive the tank once we were out in the open. I recall them telling me that if I threw the track, I got to put it back on. Needless to say, I drove it with caution, but still put it through some paces. 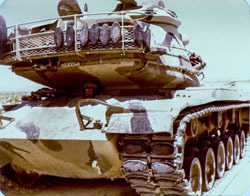 A fun fact about while we were out testing the tank out was that while on our way out towards Camp Wilson, my brother saw a car driving along the road parallel to us. It turned out to be their XO. My brother and his buddy hopped out of the tank and did everything they could to keep him from coming over to the tank, because if he saw me, they would be in deep trouble. He did come over and was getting close to getting in when all of a sudden he decided he needed to get on his way. Phew! Three Marines were finally able to exhale and start breathing easy again!! 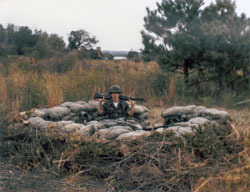 Cherry Point was a great duty station for me. I had a car by then and enjoyed the fact it was only a half hour drive to the Atlantic Ocean. My buddies and I spent countless hours there when we were off duty. 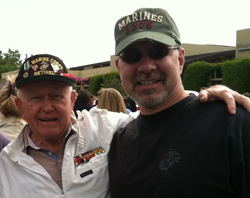 I also made a number of life-long friends at Cherry Point. We have stayed in touch all these years and enjoy looking back on our times together when we talk. I’m sure there is some exaggeration in our stories, but not a lot! A joint services op we did at Holloman AFB. We were stationed atop North Oscura Peak. The last day the fly boys put on a show for us. They flew low to the ground across the White Sands Missile Range, then at the last moment went vertical up the face of the mountain we were atop. As they cleared the top, one seemed to go 90 degrees horizontal just clearing our radar antennas and the others peeled away like a banana. Awesome display! I also never forget an event I saw take place in our tent. One of the Corporals in our unit decided to mess around with one of the Sergeants who was sleeping (he was on night shift). The Corporal, Sammy, decided to use a feather to tickle the Sergeant’s (Andy) nose. It was all fun and games for Sammy until Andy came up out of the rack with his Ka-Bar on Sammy’s neck. Sammy forgot Andy had served time in Recon and was not one to mess with, especially while he was trying to sleep. Another exercise we were on took us on a float. 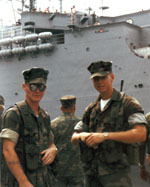 I was one of the lucky ones from our squadron who managed to make the trip to Denmark on board a ship, the USS Raleigh (LPD-1). 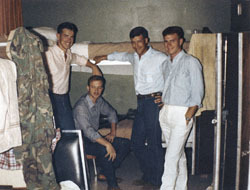 Much of the rest of the squadron traveled via airplane and arrived well after we arrived and set up camp. The trip was quite the experience, from the rough seas to one of the guys in our unit being seasick the entire way there (and the rough seas didn’t help him one bit). 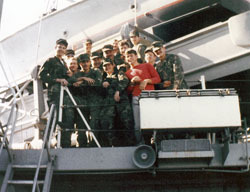 As a consequence of the rough seas we were able to “Shoot the Channel” and got certificates from the Navy for such. Our original travels were to take us over the North of the British Isles. There were some good days, however, and we were able to spend a fair amount of time above decks. As for the stormy days, well, we managed to find a hatch that contained a small-ish room with nothing in it. It was in this area that we disappeared and played tons of pinochle. Our game was quite polished by the time we arrived after a 2 week journey. I’m most proud of my Rifle Expert qualification badge. 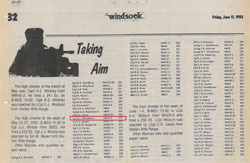 I don’t know if it was because I served in the air wing, or if it was normal, however, I only qualified with the rifle twice while I was in the Marine Corps. 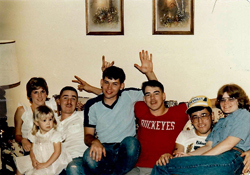 Once was in boot camp, where I was lucky to shoot Marksman and earn the coveted toilet seat. Not a badge you wanted to wear on your uniform for inspections, but it was what I earned. Fast forward nearly 3 years and it was time to qualify again. This time I shot and qualified as a Rifle Expert, and quite timely since I needed the score to put me above the line for the cutting score for Sergeant. To this day I continue to enjoy shooting and have been able to maintain my expert shooting. On a fairly recent hog hunting trip a group of hogs were running by at full speed. I put my scope on my first target and fired, I saw it drop as I was cycling the bolt and acquiring my next target. Target acquired, I fired the next shot and saw it drop, too. Total time to take out two rapidly moving targets…1 second! My hunting buddies commented that they were never going to f*** with me again! I received a Meritorious Mast for work I had done with organizing and identifying all the manuals which made up the entirety of the documentation for the system I worked on, the AN/TYQ-23 (TAOC). For those who have seen the library of manuals for this system, you’ll understand what an undertaking this was. It was a bookcase that was 5 rows high on a wall that was at least 12 feet long. For those in my unit who used the manuals, my efforts were greatly appreciated. I was honored to have been recognized. My SDI, SSgt Ahnen. He was firm but fair. Had a fatherly and grand-fatherly quality to him that cut down on the stress levels of boot camp at just the right times and in the right amounts. He was able to keep you right on the edge. I try to model my actions with my direct reports after his. I have high expectations for them, but none higher than those I have for myself. I spend the time to impart knowledge on why we are taking particular action, and how things are done in order to achieve the maximum operational efficiency. I want them to take over my job some day (so I can move on to my boss’ job!). In boot camp our light A DI had the darnedest time saying “Shoe Trees” as he was demonstrating how to spit polish our dress shoes. He kept saying, “True She’s”. As you can imagine, we tried our best to not laugh, but after the 3rd or 4th time we all let loose, especially when he finally gave up and said, “these damned things here”. Our gift for the outburst, some time in the Rose Garden! Well worth it. I stayed working in the electronics field for quite a while as a field service engineer. I started out working on main frame computer peripheral devices, then moved into the bio-medical field working on equipment that was used for the Human Genome project. I followed that up with moving into the male urological field, specifically working on equipment to treat enlarged prostates. Eventually my career took me into Program Management, again, in the bio-medical field followed by working for a major hard drive manufacturer. From there I wound along the path until I worked my way up to Chief Operating Officer of our company. Now I am working on starting my practice for CEO peer-to-peer advisory boards, enabling CEOs to come together and work on issues they are facing, but with the input and advice of other CEOs who may have had similar issues in their careers. I belong to the American Legion. I’ve been a member for many years now, but still have not committed to a single post. I’ve attended a few Marine Corps League meetings, but have not decided if they are for me. Adapt, Improvise, Overcome. What more is there to say? These 3 words and the discipline that boot camp instills in every Marine are all that are needed to be a success. I carry a challenge coin in my pocket every day, which contains these words, to remind me that everything is possible. Honor, Courage, Commitment. These are another 3 very powerful words. All put together, it seems that 6 words are an easy way to live your life and make your way through your career. However, it takes a daily reflection on what these words mean, along with a renewed dedication to upholding the true meaning of each word individually and together in order to really do them justice. Every day I start my day thinking of how far my career has advanced, and know that it is a direct result of my time in the Marine Corps. I was formed and molded by three very powerful individuals, who had help from many of their colleagues. I do my best every day as a tribute to their efforts. 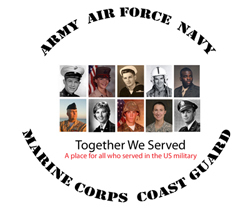 First, I want to say thank you for your loyalty, dedication, and service. You are carrying on a fine tradition of protecting the freedoms upon which this country was founded. Second, I always make the time to thank all service members personally when I see them, and I see many in my travels. I spend a little extra time with my Marine brothers. I don’t think they expect it, but I know they appreciate it. I also make it a point to attend a Memorial Day ceremony every year. I have met and enjoyed the conversations of many veterans as we celebrate those who made the ultimate sacrifice for our freedoms. Their stories are priceless, but I fear we are losing the opportunity to capture them with each passing year and the losses of these men and women. As for advice, my advice is to remain proud of what you do. No other service has the bond or brotherhood we have, and there is a reason for it. We are Marines. Once a Marine, Always a Marine! I have been able to connect with many of my lost brothers, folks I thought I would never be able to find again. It has also given me the opportunity to expand my brotherhood and meet new Marine buddies. I find that I participate more and more every day on the forums. There are a lot of interesting Marines, with plenty to say. 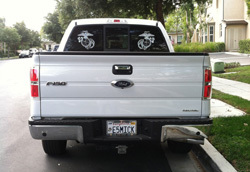 I also like the way we can share our memories and the history of our Marine Corps through the various vehicles made available by the site. Reading the Reflections of others, especially those from eras that predate mine, gives more flavor to the history of the Marines. Thanks! Hi Don – I guess we were in 3069 together at PI. Great to read your story!